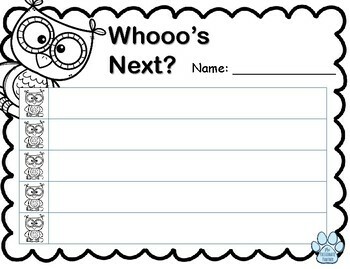 Whoooooo's Next? 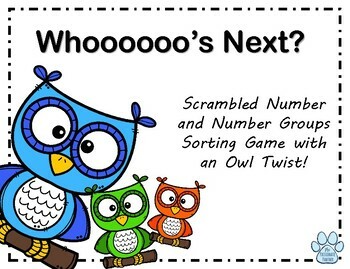 is a great activity to help students work on the concept of number order while sorting and building number lines. This packet includes 40 number cards in all that will match up to create 5 number lines! Students will sort the cards according the color of the owl. There are 5 different colors of owls. Each 'color group' makes a number line. Then, students will sort the 'color group' so that the numbers start at zero and progress on up to 11 (or 13). At the end of the activity, students will have constructed 5 number lines 0-11 (or 13)!!!!!!! The main focus of the activity is to work with numbers 0-10, but I wanted to go ahead and include a few higher numbers so students can start to have exposure to them. I have also included an answer sheet with instructions/suggestions on how to use it. This product was created using PowerPoint and was later converted to a PDF document. Please make sure you have the proper software to open the product before purchasing.